Bridget L. Martin, 28, 500 Remmele St. S.W., Sleepy Eye, received a stay of adjudication Thursday for Domestic Abuse-Violate Order For Protection. Successful probation completion will result in a dismissal of the charge. A charge of giving a false name to a peace officer was dismissed. She was placed on one year Unsupervised probation, monitored by Brown County District Court. A $75 Public Defender fee was imposed. Regina L. Carson, 53, no address, was charged Friday with a felony charge o making threats of violence. According to court documents, New Ulm Police got a call on Thursday, Sept. 22, 2016 from a Renville County Human Services Chemical Health worker who explained a situation involving Carson, who was placed into chemical dependency treatment at the New Ulm Medical Center (NUMC). Carson moved to Minnesota from California about four years ago. 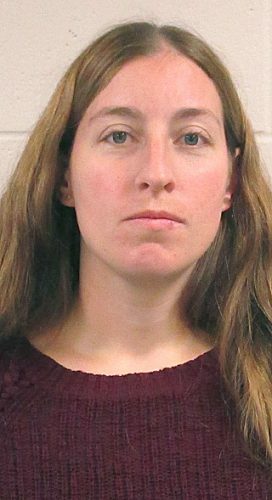 Her three-year-old child is now in foster care, pending a child protection investigation. Carson was in court on Thursday, regarding her parental rights. Police talked with a NUMC Chemical Dependency unit member who meets with clients weekly to see if they have any concerns. At the meeting Thursday, the worker said Carson stated “I’m 53, they are not going to give me my three-year-old kid back, I’ll just shoot up the courtroom.” Carson complained about counselors not being able to help her and ended the conversation stating “I’ll just go buy a gun.” The incident was documented. Law enforcement went to NUMC and arrested Carson for threats of violence and transported her to the Brown County Law Enforcement Center.